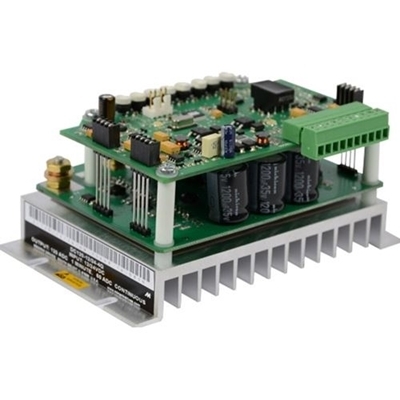 The DC-4Q series of drives are DC in / DC out PWM chassis drives capable of four quadrant reversing and braking. This series of drives is ideal for portable battery powered equipment. The DC-4Q has a sleep mode for extended battery life while not in use. The four quadrant capability allows simple connections for fast reversing and/or braking without the need for bulky contactors or braking resistors. The DC-4Q series of drives have adjustments for IR Compensation, Motoring Control Limit, Forward Max Speed, Reverse Max Speed, Min Speed, Deceleration and Acceleration Time. These drives are microprocessor based meaning these wages can be reprogrammed to meet any custom needs. The DC-4Q Family also has Power and Fault LEDs, including current limit, under voltage, over voltage, overheat, and short circuit. The DC-4Q series is available in three models, two for 12-24 VDC systems, the other is designed for 36-48 VDC systems. For simplicity and safety, no jumpers or switches are required for selecting voltages. Low Voltage motor operation: Designed for 12, 24, 36, and 48 VDC motors. 4Q reversing: Regenerative/ 4 Quadrant drives have the ability to perform quick and contactorless braking and/or reversing on the fly! Change the 4Q to a 2Q for a lower cost regenerative stopping (no reversing) model. Speed range, regulation, & form factor: 1% of base speed regulation with 100:1 (80:1 for DC120) speed range and a 1.01 form factor over the entire range. High continuous current: Up to 60,100, or 120 amps continuous, robust bus bars used to handle the current. Adding fans for sufficient airflow can increase the current rating by more than 25%. Diagnostic LEDs: Power, current limit, over voltage, under voltage, and overheat, and short circuit. Stopping modes: Brake (N.O.) or coast (N.O.) to a stop. 100% Duty Cycle: Drive has capability of outputting 100% of battery voltage. Sleep Mode: Drive enters sleep mode when disabled to extend battery life.